Theo’s goal, Wenger’s transfers, Flamini’s pain. Another one-nil Arsenal win, a draw by Chelsea, and Man U’s 2-0 win means that Arsenal finish 2008 in third place; 2 points behind Chelsea and 4 points behind winners Manchester United. Interestingly, Man U finished the season with a mere 87 points which means that Wenger’s New Year’s prediction that Arsenal needed 90 points to win the title was pretty damn close. At the time, he compared this season’s team to the Invincibles saying that “We had 44 points before Everton, which is one point less than in the unbeaten season when we had 45. So that tells you a lot about the quality of the team.” Upon reflection, he’s been banging this “this team is as good as the invincibles” drum all season and I never really noticed it. You almost have to wonder if that’s how he kept the team’s spirits high all season. It doesn’t look like we have no team and we have to build a team. We were unbeaten at home and that is only the second time in the history of the club. We have done that with young players who will be better next season. What’s fascinating about this whole dialog for me is that if you were to repeat those lines with your casual EPL fan (especially here in America) you’d get derisive laughter. But that’s how close Arsenal were this season and how misinformed your average EPL fan (especially here in America) really is. I had a “Wolves Supporter” tell me today that next year Arsenal need a 20 point lead in order to win the title. Yes, and Arsenal should go out and pick up Henri Camara to do it, right? Regardless, the season was, in fact, very close. Had the club rescued just a few points that they dropped against lesser quality teams (yes, Birmingham are lesser quality, you saw they made the drop today, right?) Arsenal would have finished exactly where Wenger predicted, 90 points and champions. But they didn’t rescue those points and they didn’t win the title. They did play beautifully, and they do have a great team in the offing, so now it is time to look forward to next season and what Professor Wenger has in store for the supporters. Today’s match was a preview of next season of sorts, wasn’t it? 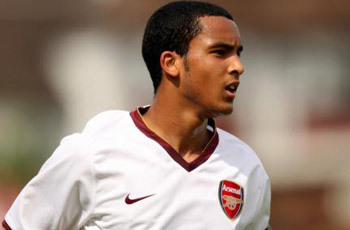 Too bad I couldn’t watch it but the match reports said that Theo started and scored the only goal. Good for him, I expect to see him a regular starter next year. Meanwhile, budding French winger Traore and young English winger Mark Randall came on in the second half. Evidently, Randall had a goal disallowed. Not bad for his (Randall) first ever EPL appearance! I can’t wait to see what he does next year in the League Cup. As for signings, you have no doubt seen by now that Wenger has a “couple” of players targeted: most likely, a tough central defender and a replacement for Flamini in midfield. He’s also saying that he’s willing to pony up the cash for someone with experience in the Premiership. I don’t know how important that will be: Sagna didn’t have any Premiership experience and was voted best Right Back in the league. I do know that buying a Premiership player is a good political move; I hear a lot of fans calling for Micah Richards and signing him would make a lot of people happy. I don’t want to get into speculation about specific players but if I were (ha!) I would suggest that fans not set their hopes on Richards because with his size and ability he plays more like Gallas than like a Ferdinand (which is what Arsenal really need). If I were to speculate? I’d say Xavi Alonso is coming to Arsenal; he’s Spanish (Wenger likes pairs and Cesc is the lone Spaniard), he’s a tremendously dependable passer, and he’s fallen out of favor at Liverpool. But see, that’s just me speculating, I don’t claim an “inside source” who can tell me, literally moments before the rest of the press, that Arsenal have signed XYZ. I’m just a blogger, like all the other bloggers, no matter how much they claim special access and still get 98% of their predictions wrong. So, why don’t we wait for the dot com to release the news instead of claiming special knowledge, and making crazy predictions like “XAVI TO ARSENAL!! !” eh? And that leads me to my final blurb: Flamini has spoken out about the “pain” he felt because Arsenal failed to secure the title and how that influenced his decision not to stay. So, he went to AC Milan, who are clearly overflowing with trophies this season. In fact, van Persie, Arsene Wenger, and I all rate Arsenal’s chance at winning silverware higher than Milan’s: van Persie thinks it’ll be 100%. Way to end the season on a high note Robin, now stay healthy and maybe you can be a significant part of that 100%. So, the season ends and like the fans, some of the players are bitter, some are hurt, and some of us are hopeful.